Island Tower condos are in a stunning, architecturally unique, oceanfront building. 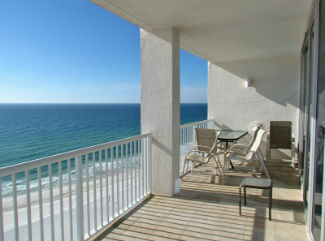 Located in West Beach, Island Tower has 66 three bedroom/ three bathroom units. With only three units per floor, privacy, space and gorgeous views are found in every unit. Island Tower has complex-wide, hi-speed internet and four parking levels ensuring enough parking for two cars per unit. Amenities in Island Tower include heated indoor/outdoor pools, a large fitness room with floor to ceiling windows overlooking the Gulf of Mexico, a sauna, a grill area on the ground floor, and a nearby children's playground. View all Island Tower condos for sale below, or read more below about this waterfront development. Sign up now for FREE for complete access to our Gulf Shores real estate listings, including detailed property specs, area maps, photos and more! Registration also enables you to bookmark your favorite properties, share listings with friends & family, and save your preferred search parameters to save you time on your next visit. Each unit is tastefully decorated and has one or two private balconies with ocean and/or lagoon views. Every unit also includes a separate laundry/utility room and a master bedroom bathroom with a Jacuzzi/garden bathtub and a separate glass shower. High-end finishing, 9' ceilings, large windows capturing ocean views, modern kitchens, and well-designed floor plans ensure that each unit is comfortable and appealing. Island Tower is in a great location within walking distance to shops and restaurants. Also nearby are numerous spas, fitness centers, and a water park. Many people enjoy dolphin and dinner cruises, the annual Shrimp Festival, and of course, the endless white sandy beaches and crystal clear water. The fresh air and natural beauty of the Hugh S. Branyon Backcountry Trail that winds through rich flora and fauna is excellent for walking or cycling. The Alabama Coastal Birding Trail is a bird watcher's paradise. The Alabama Coast is also a nesting habitat for several species of endangered sea turtles. Between May and October, it's possible to see female turtles laying their eggs on the beach at night. The Gulf Shores Alabama climate is a mild given that it is in a southern, subtropical zone of North America. 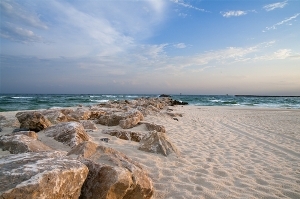 In summer, Gulf breezes cool the typically hot weather. Fall is enjoyable since the water temperature is still warm from summer and the evenings are cooler. Winter is mild with weather that varies from chilly requiring a jacket to warm enough for shorts. Most condos for sale at Island Tower include beautiful furnishings and features such as tile floors, stainless steel appliances, black out floor to ceiling drapes, and granite countertops in the kitchen and bathrooms. With excellent rental histories and solid masonry construction built to new codes, condos at Island Tower are wise investments. To arrange a tour of Island Tower condominiums, contact the Gatti Real Estate Team, Gulf Shores REALTORS®.